The 3.2km Escorts Mujesar-Ballabhgarh section which is an extension to the operational Violet Line (Kashmere Gate-Escorts Mujesar) of Delhi Metro being flagged off Prime Minister Narendra Modi through a video conference. With the opening of this section, people travelling from Kashmiri Gate Metro station in Delhi will have direct Metro connectivity to Ballabhgarh in Haryana. New Delhi, Metro Rail News: As Prime Minister Narendra Modi today inaugurated the new Escorts Mujesar-Raja Nahar Singh (Ballabhgarh) section of the Violet Line, the entire span of the Delhi Metro network reached 317 km, officials said. 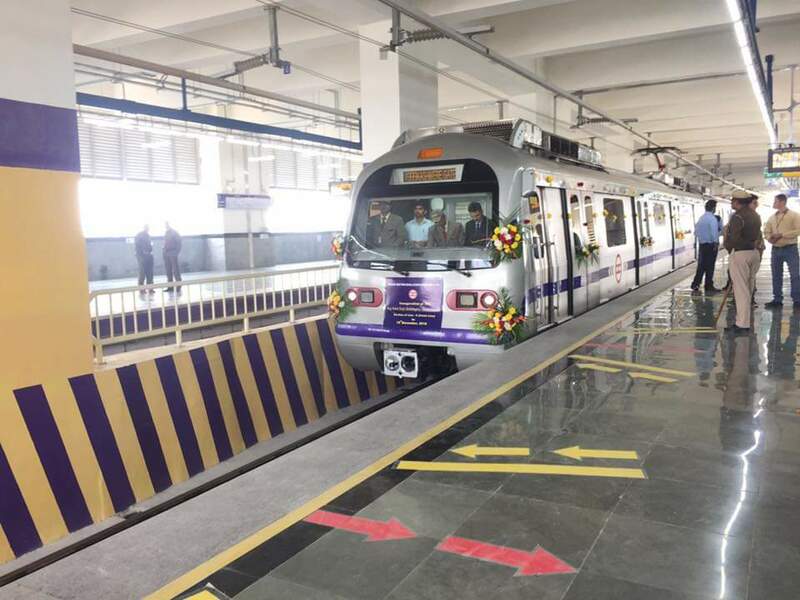 Two more stations were added to the Violet Line of the Delhi Metro on Monday after Prime Minister Narendra Modi inaugurated the newly-built 3.2 km starch of the metro line that connects Escorts Mujesar with Raja Singh Nagar in Ballabhgarh. With the opening of this section, people travelling from Kashmiri Gate Metro station will have direct Metro connectivity to Ballabhgarh in Haryana. Before this, three Haryana cities, including Gurugram, Faridabad, and Bahadurgarh, were connected with the Delhi Metro. Other NCR areas linked to the Delhi Metro are Noida and Ghaziabad in Uttar Pradesh. All trains, which till now were operating till Escorts Mujesar, will go up to Raja Nahar Singh. A total of 40 trains will be operational on the entire Kashmiri Gate Raja Nahar Singh corridor, the DMRC said. Prime Minister flagged off the Metro from Escorts Mujesar to Raja Nagar Singh in Ballabhgarh with a remote control. The Metro train started functioning officially at 5pm on Monday. With the opening of the stretch, the Delhi Metro’s network has expanded to 317km. The final nod to the passenger operation on this extended route of the Violet Line was given by SK Pathak, Commissioner of Metro Rail Safety, on Saturday. This elevated section include two stations Sant Surdas (Sihi) and Raja Nahar Singh. The Violet Line’s network that earlier ended at Escorts Mujesar has also increased to 46.6km. All trains running on this section have been manufactured in India, according to the DMRC. The Escorts Mujesar-Raja Nahar Sigh (Ballabhgarh) section will be extremely crucial from the point of view of connectivity for the city of Ballabhgarh, Faridabad, South-East Delhi and Central Delhi areas.